I’m in the early planning stages of constructing a Craftsman/Stickley Library Table. I’m consulting Robert Lang’s book of shop drawings. He states that Leopold Stickley (Gustaves son?) made the 3” square legs of this table with a quadralinear method. Four separate pieces of wood with a mitered rabbeted edge. As an alternative method I’m planning on a splined miter. The legs are 30” long and will have a 1 1/2” square hollow that will need to be filled to accept mortises. Okay, my question; should I insert the fill during glue up of the four pieces or after? My thinking is that a 30” splined miter,no matter how careful I am, is still going to be challenging. If I add the additional variable of having a perfectly square 30” long fill I am adding to the difficulty. I’ve only been WW for about three years, I don’t have all cabinet quality tools, so I’m worried. The Lumberjocks have always steered me right. Suggestions please! Thank you. This sounds more than a bit challenging. Have you considered gluing up solid legs and adding a 1/8 piece to hide the glue lines? Much more forgiving for those of us with less than perfect skills. Another alternative, if you insist on the splined miters, would be to put the fill only where you need it to support the mortises. An inch or two above and below should give you more than adequate support. I would be inclined to install the filler block when gluing the leg assembly together. This avoids any issues of hardened glue squeeze-out that may occur within the hollow, getting in the way of the filler block. It also seems to me that adding a filler block where the leg will meet the floor would add strength to the leg assembly where some abuse can occur; although this lower filler block is probably unnecessary. I suppose that the splined miter is for alignment and to making gluing the mitres easier. The spline mitred could probably be skipped entirely if a pair of specialized cauls are constructed for use when gluing the legs. Each specialized caul would consist of a base from 3/4” thick plywood or MDF whose length is that of the legs and a width equal to the width of the leg PLUS 3”. The caul would be completed by fastening a pair of parallel rails to opposite one another and aligned with the edges of the base. 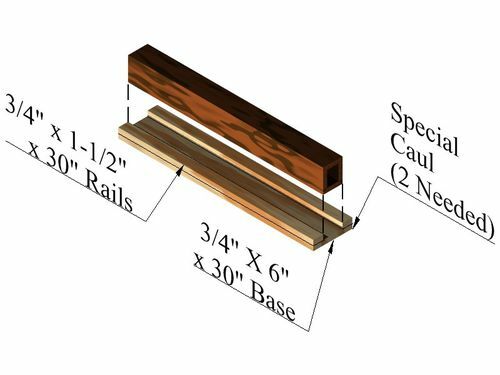 The rails could be ¾” thick x 1-1/2” wide. The inside distance between the rails should be the exact width of one face of the leg so that a leg face would exactly fit between the rails. One leg face (one of the four mitred components that make up the leg assembly) would be placed between the rails in one caul. The two mitred and perpendicular leg faces would be mated with the first leg face that is in the caul and the in-fill block set in place. The last leg face is put into position and the second specialized caul set over the fourth leg face. As clamping pressure is applied to the specialized cauls, the mitred leg faces would be kept in alignment by the rails fastened to the base of the cauls. Since these specialized cauls block the view of the mitre joints during glue-up, plenty of closely spaced clamps would help ensure tight mitres along the length of the leg assembly. Cutting the legs to length (cuts at each end) after the leg assembly is glued would make the glue-up go a little easier since the leg faces and the in-fill block do not have to be perfectly flush at the top or bottom of the leg assembly. If the leg assembly will be cut to length after assembly, making sure the leg dimensions will allow for a single cut at the chop saw or table saw would be easier than having to make two cuts at each end. On my saws, this would be less than 3-1/8”, so I would probably make the legs 2-15/16” square, rather than 3”; just for some extra insurance. Thanks for your feedback. Your technique had been suggested by Lang, but I rejected it because I cannot re-saw a 1/8” face. I don’t have a band saw and my TS only has 1 1/2 HP and will likely burn the heck out of the wood if it even gets through it. I think I get your suggestion. To restate, I’d be making two open end three sided boxes, the interior of the boxes would be 30” x 3” x 1 1/2 (L x W x D). The exterior top or bottom would have a 3/4” overhang on either side (base is 6” x 30” – 3” interior width – 1 1/2 for the side walls (3/4” each) = 1 1/2 overhang/2 = 3/4 overhang on each side. If I were to put these calls on top of each other I would have a 3”interior depth. In order to exert pressure on the leg should the depth actually be maybe 2 15/16 so pressure could be exerted before the sidewalls meet? Thank you. I used a lock miter bit on my router table for my table legs. Keeping the miters tight and aligned along the length of a leg is a real chore, your idea of splines is good thinking. The source I referenced (making legs adding fillers ) when building my legs had the “filler” blocks added after assembly (only located where a tenon would intersect). Any dried glue squeeze out (squeeze in?) makes this a real pain. In my mind adding the filler during glue up has the advantage of ease of assembly and helps keep the leg square during clamping. As an aside, Leopold was Gustav’s brother. There were five brothers all involved in various partnerships producing furniture (11 children altogether). If you’re not dealing with a taper in the leg and its a straight square “tube” column I would not be too concerned with the splines. 1) Cut all of your bevels and layout your glue up flat on an assembly table with the bevels facing down and the exterior edges in contact top to bottom. 3) apply glue to the beveled edges at each joint, and “roll-up” the assembly using more painters tape to close the last joint. You can insert your filler blocks where you need them as you roll it up. You didn’t state the stock thickness, but the stock may be fine with out filler blocks, depending on how deep you need to put the tenon. I used this method to build a pedestal table and then later did another project using the lock miter, which was expensive and took some fiddling to get right. Over all with the strength of modern glues, I would go with as described above for any future builds with a tube construct. IMHO. Thanks for your feedback. Your technique had been suggested by Lang, but I rejected it because I cannot re-saw a 1/8” face. I don t have a band saw and my TS only has 1 1/2 HP and will likely burn the heck out of the wood if it even gets through it. You might be surprised what you can do with 1 1/2 HP and a sharp blade. I used a Ryobi BT3000 table saw for many years and often made full depth rip cuts in hardwoods (oak, hickory, maple, mahogany). Slicing off a 1/8” strip from a 2’ board should be well within your saw’s capabilities. I always used thin kerf blades to give my old Ryobi the best chance. Of course, you can always cut a little over thickness to allow for any saw marks or burning cleanup. Don’t rush and you should be fine. There’s a lot of great information here; thanks so much. Another question: since the stock for the legs will only be about 5/8” quartersawn white oak I am sure I will need a filler. Initially, I was thinking alder, but nothing will be exposed, would machined construction grade spruce work? Your description is close. If the special cauls are three sided boxes, the interior dimensions when one caul is stacked on the other caul would be 30” long, 3” wide, and 1-1/2” high. When positioned during the glue-up, the rails of one caul should not touch the rails of the second caul. If the rails made contact during glue-up, there may be insufficient clamping pressure on the leg assembly. A well fitting in-fill piece should help keep the assembly square during glue-up. I hope the sketch at the end of this post helps a little (the in-fill piece and second caul are not shown). As far as 2-15/16” dimensions; that idea is relevant only if you plan to cut one end of the leg assembly flush and then cut the opposite end of the leg assembly to length after glue-up. These post-glue-up cuts would ensure the legs are flush at both ends without much fuss during the glue-up. The slightly smaller leg assembly dimensions would ensure that the cross cuts are made in a single pass using a 10” saw. If you have a 12” cross cut saw, the depth of cut on the 12” saw should cut through a 3” x 3” leg assembly in one pass. A 10” saw would barely make that 3” x 3” cut in one pass. I would avoid construction grade lumber for the in-fill block. Construction lumber can have a moisture content nearly 20% whereas properly dried oak would be in the 6% to 8% range in Arizona, around 8% elsewhere. Poplar would be the unseen secondary wood I would use on this project.